Girls Varsity Soccer · Jan 24 COUNTY CHAMPS!!!! 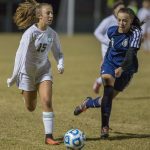 Weeki Wachee girls soccer team defeated Central High School 8-0 to win the Hernando County Championship. The girls will be back in action next Monday with their first round district game versus Springstead High School. The Lady Hornets girls soccer team will be taking on the Lady Bears of Central High School tonight at The Hornets Nest with JV starting at 6 PM. Varsity will follow after. If varsity wins or ties, the Lady Hornets will claim their first county championship. The cost of admission is $4. Girls Varsity Soccer · Jan 12 Girls Soccer County Champs!! With the win over Springstead, defeating the Eagles 6-0, The Lady Hornets have clinched the county championship. Congratulations ladies!